With a little more time to spend browsing blogs I've been clicking through the blogrolls to see what comes my way. 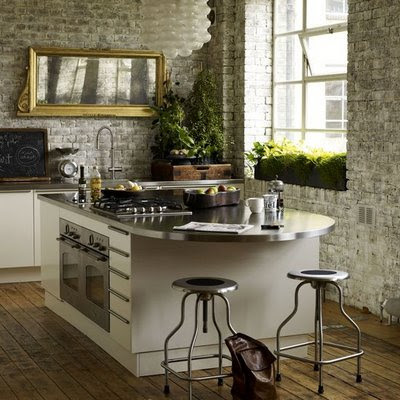 I ended up reading a post about whitewashing bricks, featuring this lovely kitchen. You really can find the instructions to do anything on the internet. While I can see the beauty and performance in sleek and shiny kitchens, the textures and greenery in this one spoke to me. 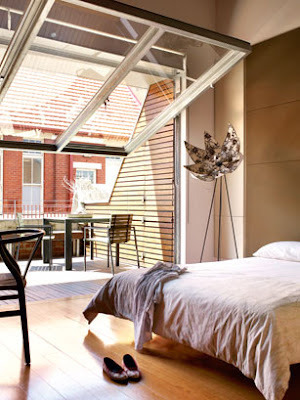 Love the mirror and the light fitting and the brick / steel / wood mix. About 10 years ago I spent a lot of time in planes flying around Europe over the farms and fields, for hours and hours. 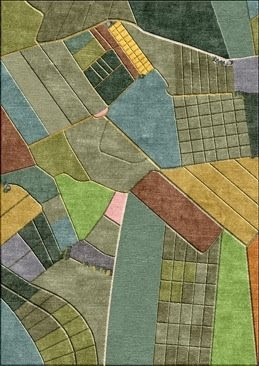 These beautiful rugs by Liz Eeuwes are inspired by these aerial landscapes - what a unique idea I thought. 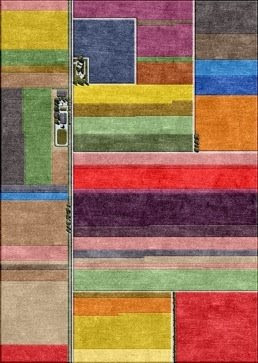 The first rug is inspired by Scottish landscapes and the second the tulip fields in the Netherlands - a view I missed out on personally. I just love the colour palettes and the detail where she has included roads, little farms and their shadows. Busy busy with lots of milestone birthdays (not for me - but for others in my life) so have not had much time to spend here this week. 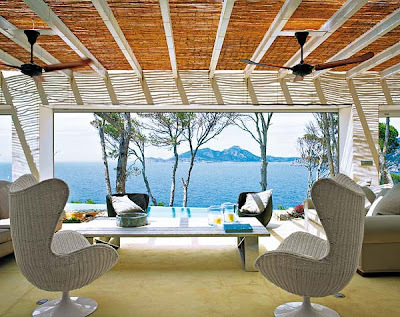 The pressure is now finally off - and wouldn't I love to be curled up in one of these chairs looking at that view. I do love egg chairs but now that they are all over the place - ie poor copies in real estate agents lobbies, the wicker is a refreshingly different take on the classic. 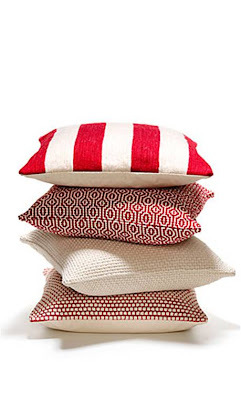 Country Road cushions were made for my living room. I inherited lots of roman blinds made from a narrow striped dark blue and white ticking-ish fabric and I have an armchair in white, a brown leather sofa, a big red bean bag for the kids and another white slip covered sofa going in soon. 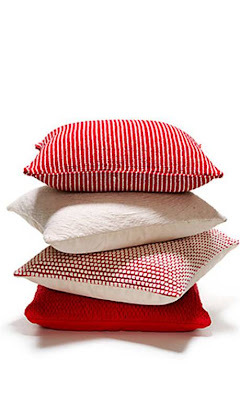 So to draw it all together I throw a selection of different textured red, white and blue cushions around the place - many of which come from Country Road. As my kids sit, jump and play on these every day, they don't last for ever but thankfully Country Road change their range all the time. The important thing for me is that the core colours seem to stay and most have removable washable covers !! 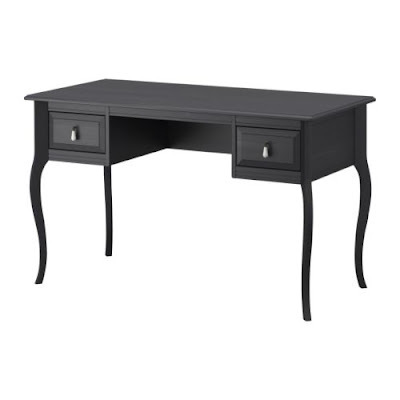 As I write this my keyboard is sitting on our 'temporary' desk which we have now had for three years. It is actually not too bad -its a full size plain interior door on legs which as its so long can seat two people comfortably. As the study is still in 'temporary' mode it is also the house dumping ground and holding area, which always happens I find if a room is half done. We long for the day when we have organised the study and put in proper cabinetry like this. 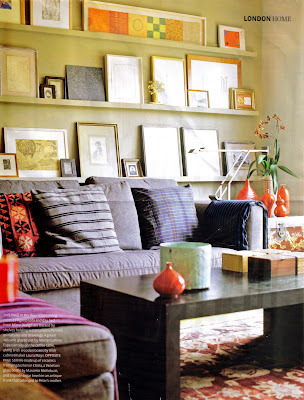 The side shelves look like Vitsoe shelving which I love and have written about here before. A friend said to me once though - if you want to live minimally you need somewhere you can stash things until you've got them organised or thrown them away, so I wonder how we will manage when we no longer dump everything in the study . . . I never have time to visit IKEA during term time and try to avoid it all costs during the weekend so I usually make time to go during the school holidays. This was quite a productive trip which is good - you never get those three hours of your life back again !! One new range that caught my eye is the Edland series. 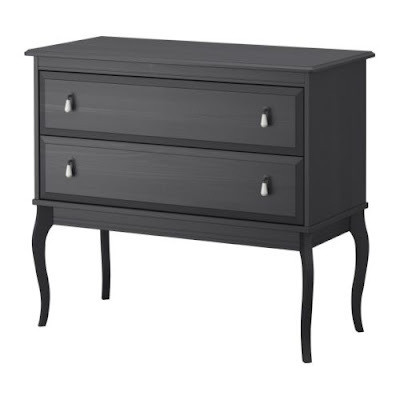 It is a lovely soft grey colour, the drawer pulls are ceramic and a nice weight and the drawers are lined with a patterned fibreboard inside. 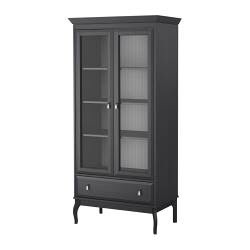 The range is designed for the bedroom but I think it could be used in other rooms especially the dressing table and linen cupboard below. 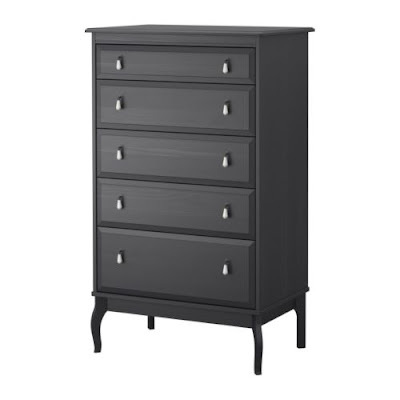 One comment I would make is that these are not heavy weight pieces and would only be suitable for light storage. I'm thinking pink and grey would be a bit different and lovely for a little girls room. More to share from my IKEA safari soon. 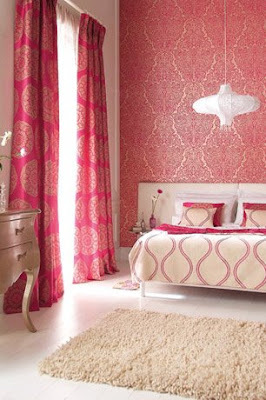 Harlequin fabrics and wallpapers have some lovely designs in their Iznik collection. 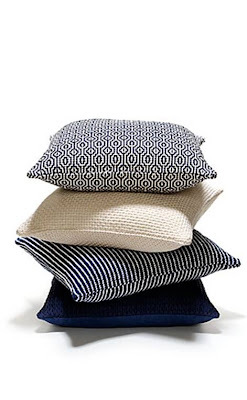 I particularly like 'Kara' - it is on the big square cushions in black with a neutral wave pattern and vice versa on the cream cushion at the back. I think its very effective as a bed cover in the pink colourway in the second photo below but I would prefer it in the more sophisticated black and beige. 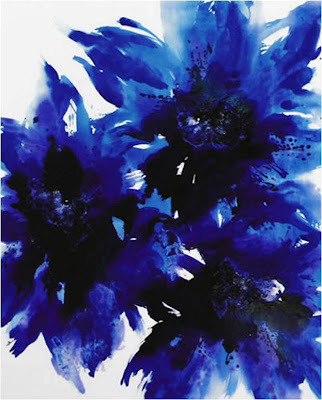 Some friends of mine introduced me to Andrea Byrne's paintings about 5 years ago when I was living in London. 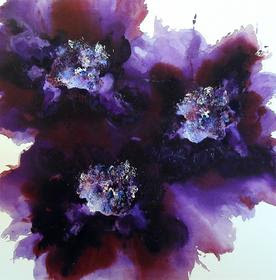 Her paintings are pretty dramatic and vibrant - often large scale - and I would love to own one sometime. Andrea is both an artist and fashion illustrator and there is lots more of her work to look at here. NYC based designers Nathan Egan are favourites of mine and this is another of their designs - this time a kids play room. Having two boys myself I like the way the layout gives each child some personal space to store and show off their favourite things and there is still lots of open play space on the floor for them to play together. I think the Kartell Eros chairs work really well and they are very comfortable - especially for a little person. We are also not far away I feel from having a dedicated laptop or pc for the kids (and mine are only 5 and 3) as already at weekends the pressure on my computer can be pretty intense !! It's a slippery slope - I did the whole 'cough so no one will notice' and tore this image out of an old copy of Belle magazine in the doctors waiting room yesterday. 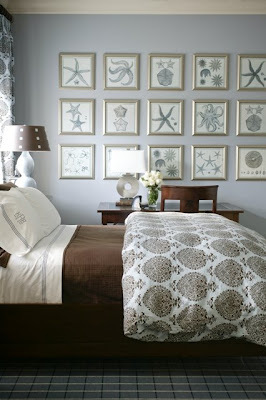 I don't normally do that but this is exactly what I want to do with picture rails in my family room so I couldn't leave it behind. One page is better that stuffing the whole magazine in my bag I reckon. I am about to ship out our big Expedit full of books and toys to the spare room which will become the boys play room. 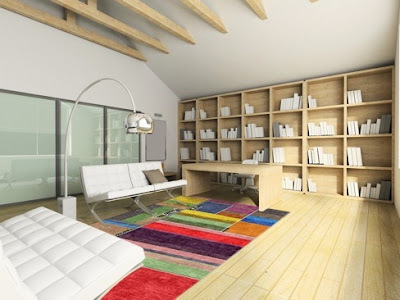 I am going to reclaim the living room and use the wall space currently behind all the toys and books to create a look like this. You can now buy picture shelves like these at IKEA starting at $8 for smaller lengths which I will paint to match my walls and work from there. I think this is a very inviting and practical living space which are exactly the two goals I am trying to meet. It is not often I feature an appliance of any kind but I always find it hard to pass by anything with Paul Smith esque stripes so here is the Cool Drawer from Fisher and Paykel. Fisher and Paykel have a customised shipping container called Ironside which they fill with all the appliances of the future and tote it around to exhibitions. This photo is courtesy of Lucy at the The Design Files. 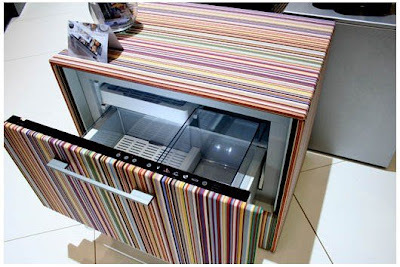 Apart from loving the stripes I do like the idea of a few cool drawers around the kitchen and house. The idea is that they can be set to freeze, cool drinks or fruit and vegetables depending on where your cool drawer is and what you want to use it for. I wonder though, environmentally, would three or four cool drawers use more power than one big fridge ? 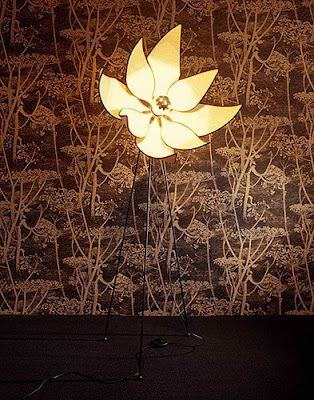 I spotted this lamp - the Lotus Tripod - in an article in House and Garden about a Melbourne home built in a beautifully converted Anglican church hall. The photo at the bottom is the master bedroom and adjoining deck. More about that house later but for now back to the lamp. 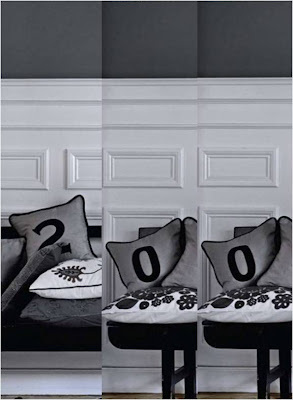 It is from Surround Interiors and it would appear that you can customize it. 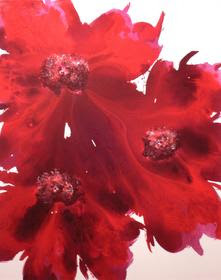 It reminds me of Vietnamese silk lamps - as if one had opened up like a flower. This is my two hundreth post. I had wanted to celebrate by organising a giveaway but life has been a bit hectic recently and the blog has had to take a bit of a back seat. I started in September last year so I am now resolving to get myself sorted and do something on that milestone. 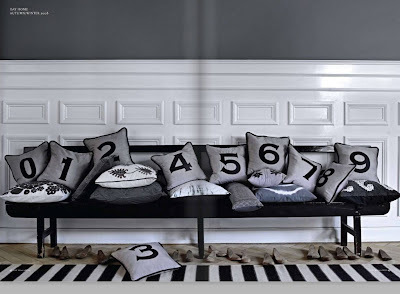 So a big thank you to all of you who have joined me here so far and for your encouraging comments and for now, here are some suitably numbered Day Birger et Mikkelson cushions in a gorgeous hallway. 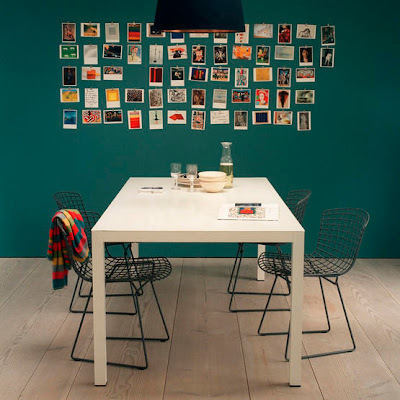 I love this table designed by John Green. John Green is a recently qualified designer based in the UK with more than one prize winning design under his belt if you read his bio. 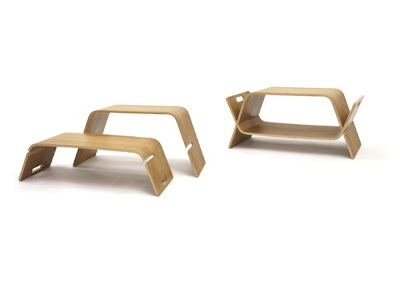 Embrace is a new take on that oldie but goodie - the nest of tables. 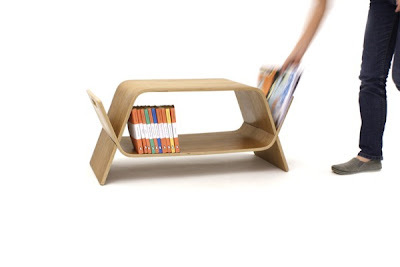 When the two tables are clinched in their 'embrace' the table is designed to hold books or whatever you like underneath and magazines on the sides. When you need two tables the you just slide out the bottom section and flip it over. Ingenious. One of the questions below was 'do you collect anything ?'. 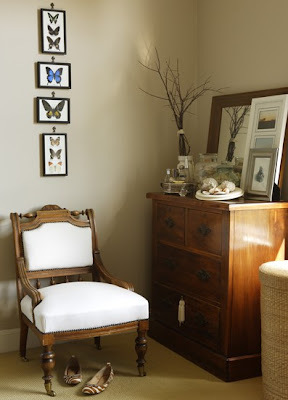 I love a collection in interiors - whatever it might be - as it really personalises a space. 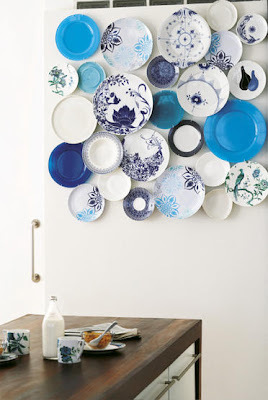 It also can be a pretty thrifty way to decorate - using what you collect anyway. I read about a couple who had frames filled with all the concert tickets they had been to together which looked great. I do hope my husband doesnt get any ideas about his Wallabies ticket collection - thats not quite the look I'm after. Lorna at Garrendenny Lane Interiors in Ireland has tagged me. So in a rare departure for Folder of Ideas here is some stuff about me. The idea with this one is that I answer the questions, removing one I don't like and adding one of my own and then tag 8 other people. Therein lies the challenge as I am not a very bloggy blogger involved in link exchanges or giveaways or comment exchanges so I am not sure if those that I tag will respond - but we will see . . .
What was the last thing you bought? A rare purchase of makeup for myself, a pile of boxes of Lego for birthday presents in the sales and some very dodgy bling at the two dollar shop for a party we are going to on Saturday night. What do you think of the person(s) who tagged you? I am in awe of all the different things Lorna has on the go in her life - her family, blog, businesses. I admire her taste - she stocks some of my favourite designers in her shop like Black+ Blum and she' been really supportive on my blog with lovely regular comments. What is your dream job? One that I can work 4 hours a day 3 days a week in something related to interior styling and is amazingly lucrative !! Dream on ! Do you collect something? I have a bowl of marble and stone eggs that I add to on my travels. If you could change your name to anything, what would you call yourself? I was supposed to have been called Sarah but my parents changed their minds. Given that I married an Australian Sarah would have been better all round. What is your favourite smell? The smell of rain after a long dry patch, Clarins Eau Dynamisante which I wear every day. How many times do you press the snooze button before you get up? I rarely set an alarm. What’s your biggest fashion mistake? White stilletos in the eighties in Ireland in the cold with blue feet. 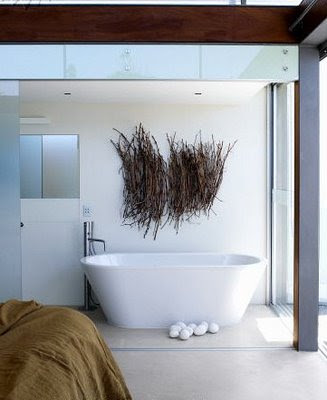 Texture, texture and mixes thereof is the key I believe to great rooms and spaces. These photos are by Prue Roscoe. When you look at the first shot - I go, that looks good, that is a look I could copy and then you see this bathroom's setting in the second shot and just go wow. 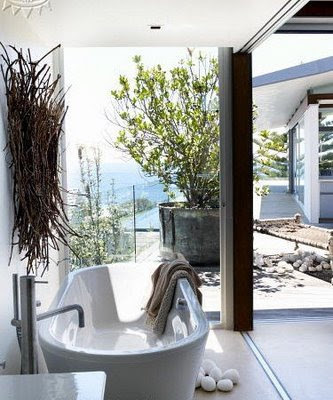 The water view, the deck, the glass fence, the big shrub screening the bath - not quite so easy to conjure up at home. 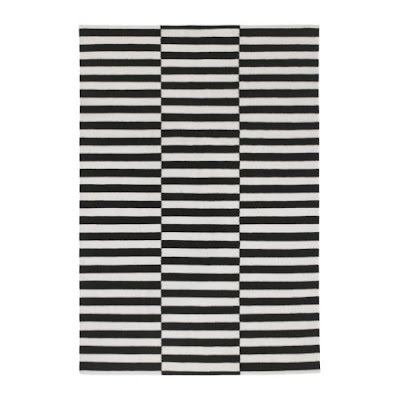 I must have a look on Design Sponge to see if Grace has listed black and white rugs as a mini-trend as I seem to be coming across them everywhere. 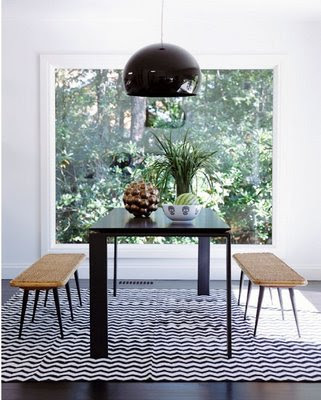 This rug is from the IKEA Stockholm collection which has been really well received in print and on the blogs. 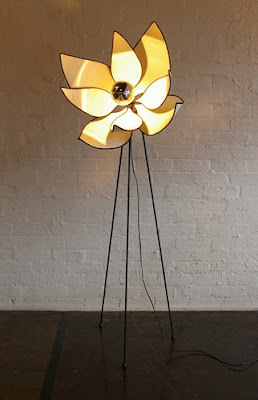 Some of the collection has been around for a while but new elements seem to be arriving bit by bit here in Sydney. I usually go in the school holidays as, like his mother, my eldest loves a trip to IKEA so I'll be checking out the rest of the collection soon.